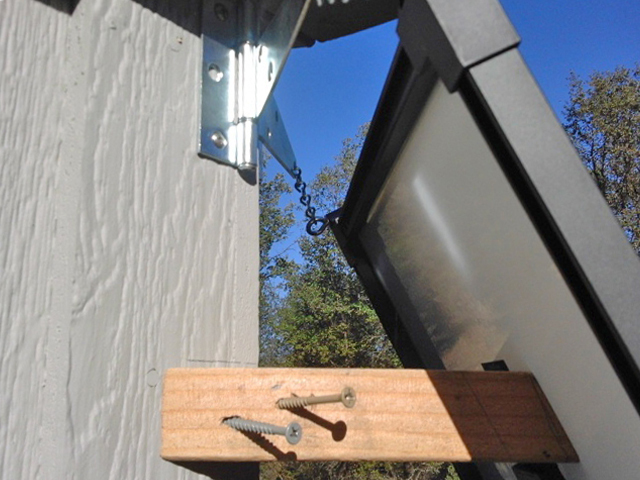 The shed doors face …UPDATE MY DIRECTIONAL DYSLEXIA: due-west DUE-EAST…and I needed a way to mount the solar panel on an angle to catch the sun, so I put a 4″x4″ post in the vise to start the mock-up of my corner mount. 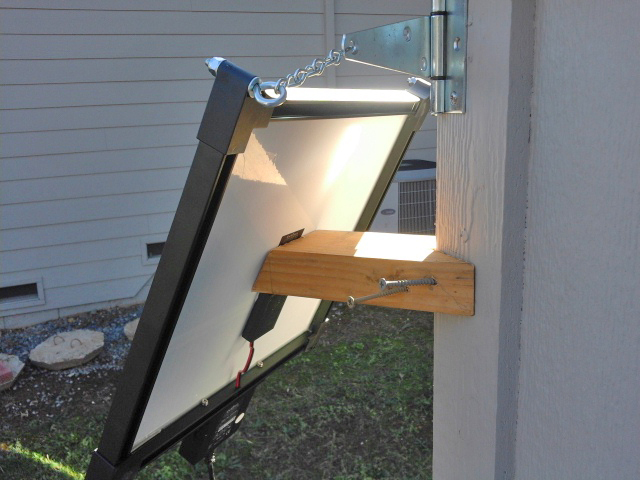 At Ace hardware I found the 12-foot extension for the Deltran solar panel lede, and a couple t-hinges with about a four-inch leg. On the 4×4 post I attached the two hinges on opposing faces, on a 45-angle. At Tru-Value I found some 2-1/2″ eye bolts the proper small-ish diameter thread to fit through the corner holes of the 14″x16″ panel, and got a couple feet of light chain. Then I took a four-link section of chain and ran it through the eye-bolts and the ends of the hinges. Voila! 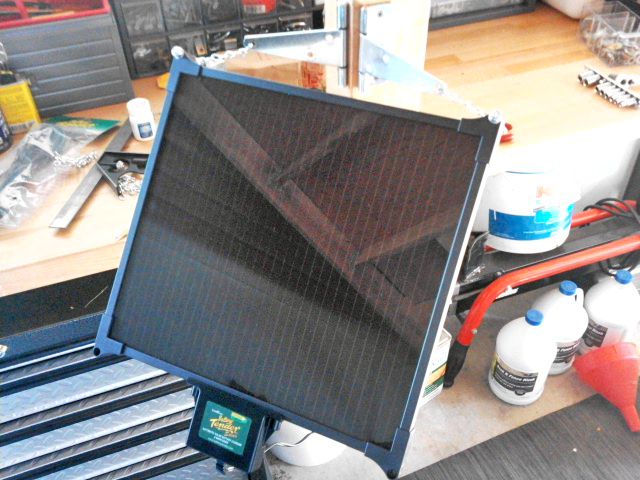 Next up it needed a brace for the back so the panel laid-out out at the right angle to get the solar waves and rays, so I put a piece of 2″x4″ in the vise, set the saw at a 45-degree angle, and made two cuts so the brace would fit on the corner. A third cut was made for the angle of attack, which was too shallow at first and had to be re-cut for a steeper angle. I pre-drilled a couple holes in the 2×4 brace for deck-screws, to make the corner attachment tight to the siding, then ran them in short to mark the hole-locations. It was kinda fiddly to make the final tight-fit without first pre-drilling, because the brace wanted to move around a bit and being on a corner it pushed one way then the other. 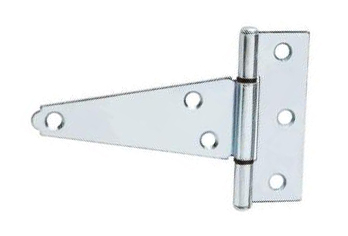 I ran the lede up around the brace to the door side, and from the inside-out drilled a 1/2″ hole through a shed 2″x4″ cross-member, to the the hole up-high under the eave. Running the lede through the hole and along the upper interior sill-plate, I screwed-down wire anchors every few feet and dropped it onto the mower location and hooked-up the charger. To finish it off I gooberd a bunch of siliconized plumber’s caulk into the hole to keep the weather and bugs out of the hole. Now listening to the pitter-pat of rain on the gutters, I’m glad I got ‘er done. I was feeling a bit frustrated about things in the garage at the ranch being disheveled and just not in the kind of shape I’d like for-to get ‘er things done. Like cleaning guns for one thing, and my lovely and talented and telepathic wife picked-up on that. Earlier on Sunday night in the coolness of the evening and with twelve sacks of tanbark lying around, I laid-out landscape fabric and cleaned up the area under the “pear” tree (“pear” because they are micro-miniatures and inedible and not real fruit except for being annoying – fruit is annoying). Then I started-in and ‘barked it. Looking good! Likewise at Airport House, in and around the propane tank there was some need to better define the spaces – and by that I mean it needed bigger and more impressive rocks. We have ’em. The small, shoe-box sized, little rocks just lack presence and drama, even piled in a heap. You need some big ones to define the space. So we spent some time yesterday heaving and hauling and moving the big bad-boys – the 60-pounders and such – into more aesthetically pleasing locations and sites. And so We did that again today (this morning) too, and then ‘barked it. Nice!! My back is stronger now and not troubling me, knock on wood. All done before the heat got-up, at 10:00 it was time for a Costco run. After that we loaded the 200-lb behemoth 8-foot Gladiator maple-top bench into the back of the F-150, and along with that a tall rolling cabinet, a bunch of crap, and headed to the Ranch. Unloading went faster because things just fall down. Then another trip the Airport House and a rolly-cabinet – the five-drawer – and back to the Ranch… Phew!! And the biggest challenge of ALL: the forty-drawer (miniature) nut-and-screw organizer-thing for all the weird crap. All the old fastener detritus that I had been neglecting and saving in zip-loc baggies, the weird and unfathomable mechanistic flat-top wood and machine-thread junk… And put them in a new, shiny, plastic same-thing but not stinky organizer. And things like electrical wire-nuts and fuses, and just crap. Still have to dismantle the pre-existing wood-bench and save the plywood for decking up in the attic and the 2×4’s for various…but I’m on the home-stretch. More or less. There’s still the mud-and-tape and paint – but with mobile garage boxes that’s easy and a separate chore. Time to hit the hay. Apparently the refrigerator occasionally needs to be re-stocked, and at my house that’s my job – so a day of rest, Raley’s, and laundry is on the calendar. And fresh produce from the local farmer’s market at Boa Vista Orchards. More about the Super Fabulous Star-Studded Celebrity Rendezvous-X upcoming! The brief pause in fix-it activity was a blessing. There is a reason to keep one day Holy and absent of work, so that the suffering is not prolonged unalterably. 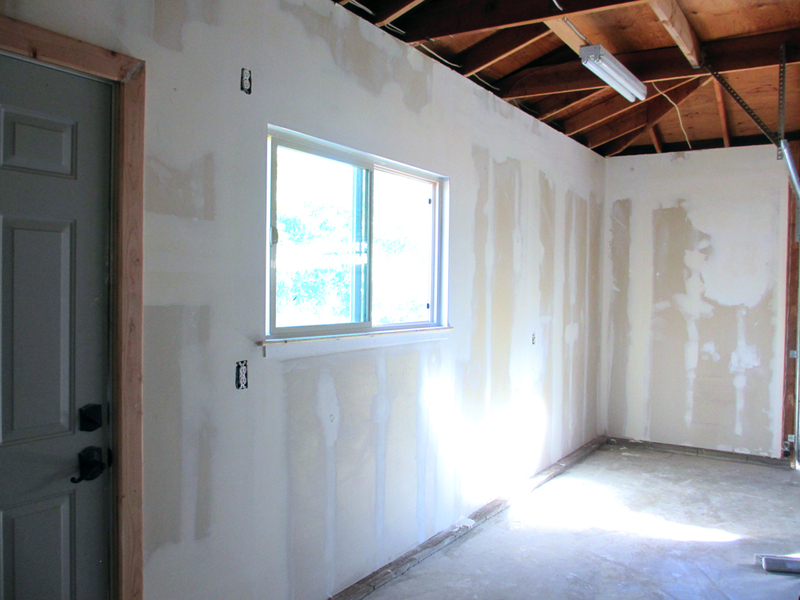 But we needed to get the closet finished and the door-stops done – and we did. The DeWalt screw-gun is a blessing, and so is the hammer-torque driver. And so is the battery-operated skill-saw. Meanwhile I received a letter from my Old Friend and mentor who hired me for the first Real Job that I had, one with some responsibility and one that proved I could do it. He taught me to drink single-malt Scotch neat, and always had hair-raising stories – like when he was Stage Manager for the Rolling Stones “Sticky-Fingers” West-Coast Tour and had to provide Security for the mis-managed event at some Arizona University arena full of College Kids who were clueless… He had a stroke several years back and went from lopsided shuffling, to walking with a cane, to full wheel-chair invalidity. While I was between-jobs (on one of those many occasions), I acted as his butler – or something. He is a man with a precise and photographic memory, and the stroke had no effect on that or his speech, but the physical debilitation has had an un-happy cascading effect. On my calendar was a birthday reminder, and so I sent him a belated Birthday card/thank-you for taking a chance on me, the weird-kid all those years ago. He and his wife were close friends through my Theater years, and my girlfriend/now-wife attended many annual summertime Croquet-Tournaments/drinking-party that they hosted with other friends from that Theater Tribe. In later years and following a different career trajectory, and after his illness we were not as frequent visitors. But it was good to hear from them, very good, and they were both pleased to hear from me/us. That’s it for now, partly. I picked up some nice actual-wood wooden screen doors that I will fit, they will allow for a cross-breeze and keep bugs-out on days when it’s not too hot and the A/C isn’t cranking. Oh-and the “lawn” -the one that’s decorative – not the wide expanse of Prairie – on the other side of the Ranch, needs mowing. And weeding. Carpetization is coming Thursday to the Low Granite Outcropping, and it’s a serious lot of the shaggy-stuff. Which means moving a LOT of once stationary and heavy furniture to a location where it’s not in-the-way of the new underlayment. Also means time to paint that nasty closet with the yellow-orange “Dried Plantain” interior. Yecch-yellow. Seriously?? A huge walk-in closet painted something other than white?? That is just El Stupido – to paraphrase The Don. So we work and we move stuff. Meanwhile plans to go forward with Mud&Tape at Los Garage De Los Ranchero advance when new BFF comes by on Tuesday night after his current day-job doing tile at a house-flip. Pay-Money Work up here is scarce, and the thin pale ones doing hated retail under fluorescent lights in air-conditioned splendor don’t know how lucky they really are. Back-When I applied at so many places for such work and was always turned-down. Also many front-room food-service jobs were simply wiped-away by my lack of bi-linguality. No Habla. 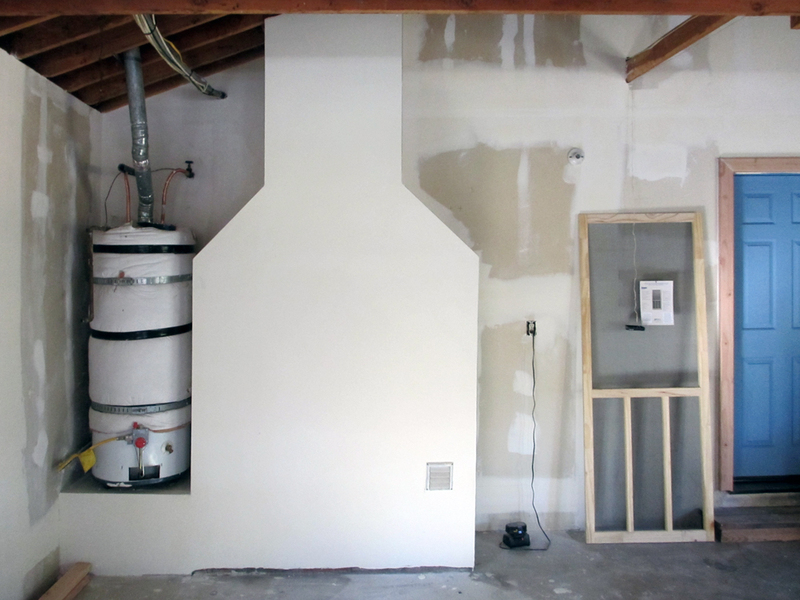 But now in my “retirement” we may have to revisit that trend/opportunity – just as soon as I spend all my money on retrofitting this/these place(s). I appreciate the fact the guy has no life and will work more, after first-work. I was up Friday night ironing shirts. “Sorry I can’t, I have to wash my hair.” Remember that one? With me it was common enough back in The Day. Today it’s entirely possible to hear it again, but from me – that is if you go by “my hair” as a singular noun. There’s one thin one sticking up in the middle of the glowing dome. But enough. Spend it while you got it. Blow it up. Pour radioactive crud on what’s left and blow it up again, then light it on fire and throw it into the ocean, onto a whale. See if anybody remembers you. They won’t. Awoke to overcast, and mid-coffee it actually rained. Lunch at Bricks and then a visit with our favorite Darling-of-Retail at the Western shoppe – who’s quitting! Fortunately we’ll see her again soon at the Gun-Club Picnic, since her grandfather is Treasurer. Trying to reach a contractor to get a bid on a quick mud & tape job for the garage and the phone glitches and blurps and I’m in some kind of cellphone dead-zone. So I tried another avenue, and it worked with the guy who’s got experience here already – and I’d rather pay local than a guy living out on the 80-corridor in Roseville. But local guy is in the middle of a flip, on his hands and knees laying tile, so the project might have to wait a while. Oh well, carpet is coming and there’s paint to do at the other house. 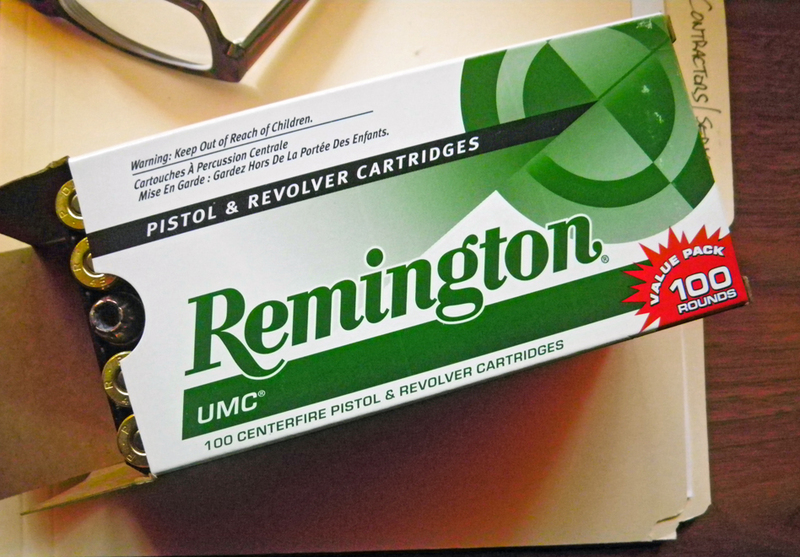 So off to the new Gunshop in town to meet the guy – Jeff – then to Wally where they had this which I had not seen in ages. And JHP too. It was 102° on Friday with slightly lesser temps in the high 90’s on Saturday and today (Sunday) dawned bright and cool so I went out to mow. Out in the middle of the tall grass the twin rotating blades ceased to rotate. Maybe it was the hidden stump I hit? But that was earlier, and I kept mowing – so I disengaged the deck and drove up to the wash-out point and hosed it down to get all the green crud off and have a look-see. Kinda dark in there and the bright sunlight hitting the other side – I can’t see much but one of the belts is not running on the pulley, and just seems a bit loose. Maybe I burnt a belt? Without being able to take a closer view and understand the situation I’m stuck – and my big fat wheel-chocks are at the other house. Time to take a shower and have some breakfast. Lights and Lamps: Down at Costco we picked up and installed seventeen on-sale 14-watt LED floods to replace the 65-watt incandescent ceiling heaters and PG&E cash-register ching-a-ching-ching lamps. And they’re fully dimmable and work in the existing can-lights with no extra mods. Bright but cool to touch, the lamp color is normal and not some ultra-white surface-of-the-moon effect. I have two, 2-way wall switches to replace the current flip-switches that are good for dimmable LED’s and that will help in the main open-concept space/room to bring down the brightness for when we don’t need surgical lighting. On a gray rainy day it’s good to fiddle with organizing the re-loading bench while the rain-barrels spill water out the tops. 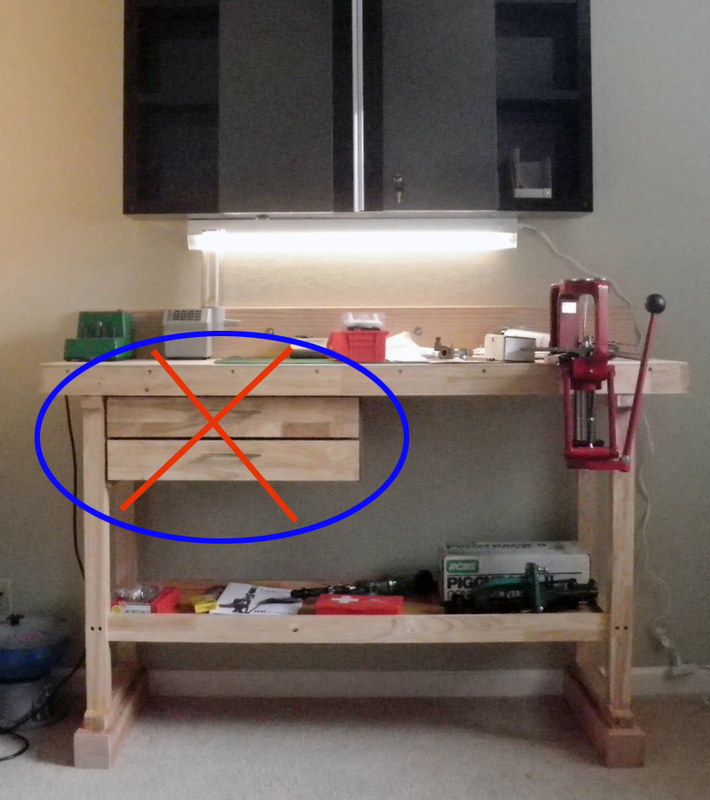 The two left-side drawers of the Harbor Freight bench that did not fully open on the cheap Chinese drawer-slides finally had to go, at least now the lower shelf is more readily available. Also now there’s room for another press (the RS-3) and the upper cabinet can be used as tool storage as God intended. Meanwhile as the rain pelted-down in a steady pour, I went out on a ladder up on the deck to check a corner downspout because it was overflowing at the roof-line, backed-up vertically almost twenty-five feet. Cleared some pine-needles at the top-end and then went down by the understory and I yanked the diverter hose to the big-barrel so the water flowed freely, but a closer inspection and clean-out will have to wait. UPDATE: Well that didn’t last long. The rain is coming in waves, and you can see the wet clouds streamin water as they approach, coming across the ridge at us, blanketing and hiding the ridge behind – and the water was backed-up again to the roof. In a few minutes I was back down there with the DeWalt drill and removing the diverter. As I removed one screw, a stream of water poured out as if from a hose, then the next, and finally a huge spray of water surged up and hosed me down with blockage: dirt, pine-needles, and sand from the composition asphalt shingles… But now it’s REALLY flowing freely. Morning dawned cold and bleak-gray, and there were chores to do and decisions to make, even (or especially) on a Sunday. Got my haircut so I could think clearly, and then went on-line and joined the El Dorado Rod & Gun Club – the oldest active Rod & Gun Club in California, 103 Years! 1911 – 2014 – and also bought two dinner-tickets to the Club Banquet & Raffle in a few weeks. I need to get out and meet some guy-people because the sign at the door isn’t going to be mistaken as an invitation to tea. It’s been a year and my most recognizable best “friends” work the check-out at the grocery store. And after a year my wife is tired of spending ALL her free time with me – she needs a break from this relentless twosome-ness. Also while we’re both struggling with a bit of nasal/respiratory congestion and making awful snot-goober noises, some distance might be preferable. And so as a birthday present to me I signed up for Joe’s all-day Shotgun class. Then we went back out to work on the yard together. Like my haircut, it needs some clipping around the edges every three weeks whether it needs it or not. At least we haven’t seen any snakes yet. If you grew-up in a Protestant-religious household this song might tickle a few funny-bones.